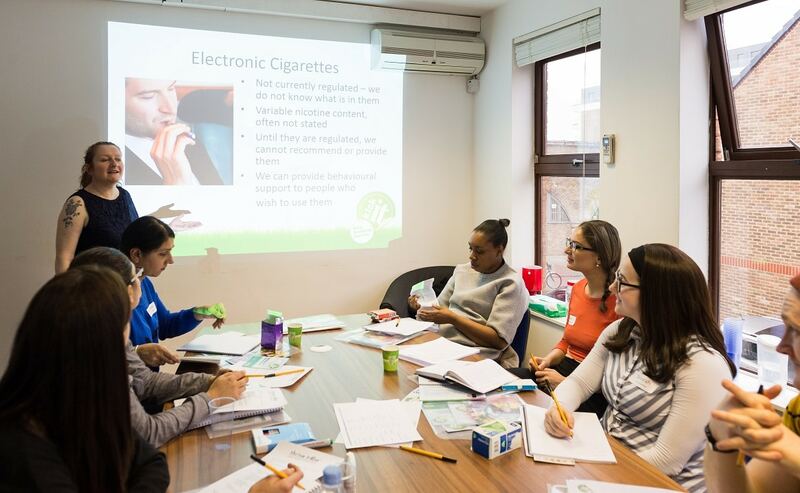 The Kick-it Stop Smoking Service has been working in Partnership with One You Hounslow to deliver a series of Making Every Contact Count (MECC) Smoking Cessation training for Maternity and Obstetric staff. Smoking at time of delivery prevalence rates is at an all-time low, however, an analysis of 3 years of data at Chelsea and Westminster Hospital identified big variations of smoking prevalence between patients living in the most and least deprived areas. Kick-it delivered multiple sessions of MECC training across Chelsea and Westminster Hospital reaching 58 Health Professionals between May and August 2017. We targeted staff to advocate as Health Champions who would promote the service to others, 47% of the participants were Doctors, 22% and were Ultra- Sonographers and 31 % ranged from other clinical and non-clinical staff. To see a 10% increase in referrals to smoking cessation services in the 6 months following the training sessions. Since the training, there has been an increase in confidence from those taking part to discuss the health harms of smoking with their patients, increased knowledge for those not involved in maternal delivery services which has promoted a whole hospital approach and staff felt better equipped to advise patients on smoking-related matters during pregnancy or the post-natal period. This programme of MECC training clearly identifies the benefits of providing training when it is designed to engage clinical and non-clinical staff across all grades in secondary care. Following the training, Chelsea and Westminster Hospital is on target to increase referrals by 20% of patients who have been smoking during pregnancy. Kick-It Stop Smoking Service is provided by Thrive Tribe Ltd and commissioned by your local council in partnership with the NHS – www.thrivetribe.org.uk.